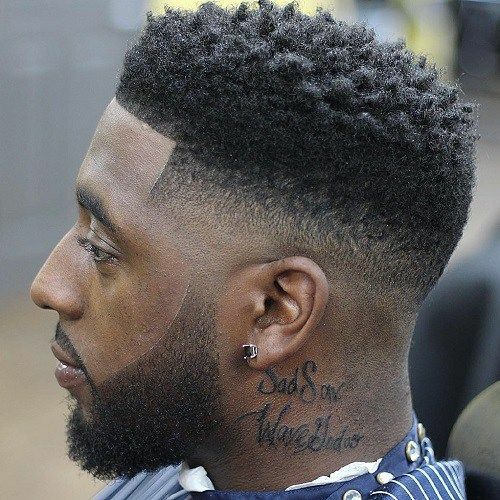 The fade haircut is one of the most popular haircuts, mostly followed by African Americans and the shadow fade haircut stands out among them to be the latest in fashion. The striking feature of the shadow fade haircut is the smooth transition of the hair from the crown down to the nape of the neck, where the blending of different lengths of hair with the hair on the top appears to be amazing. The hair gets shorter and lighter as the haircut goes down from the top to the back. You will need a skilled barber to perfect this type of haircut. 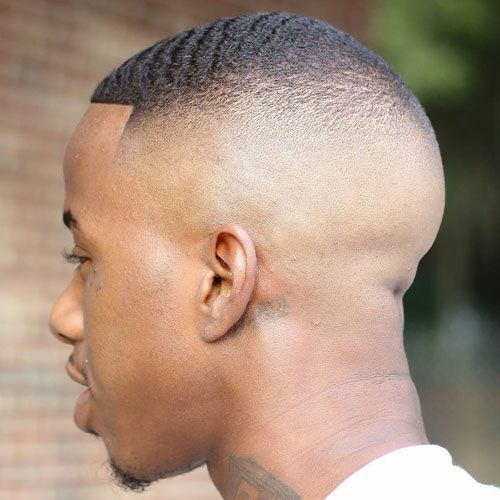 The direct blending of the hair with the top is the main feature of the shadow fade haircut, where the hair gets shorter as it goes down towards the neckline. Long top and shorter sides are the themes of this hairstyle and the fade can be low, medium or high depending on the style. This is a subtle and clean haircut providing a professional look, as long as the blending is perfect. The best part is that you can get the shadow fade with a variety of hairstyles. The tools you will need include, hair clippers, faders, comb ad a razor blade. Step 1 – First of all determine the position of the fade lines. Step 2 – Use a sharp scissors to trim the longer hair on the top. Hair is better the closer to the head it is cut. Step 3 – Use the hair clippers to cut the hair shorter from the bottom. Bring the clippers closer to you as you cut the hair at an angle as soon as you reach the first fade line. Cut the hair gradually and not too much. Step 4 – Continue cutting the hair at an angle as you go upwards, reaching the fade lines one after the other. Begin by cutting the hair along the width of the head. Step 5 – switch over to the shorter gauges of the clippers as you fade into the next layer of the hair downwards. This will help you to cut the hair closer to the scalp. Step 6 – Get rid of the excess hair by combing through, and use the trimmer to trim the hair at the back and around the ears. Step 7 – Continue cutting the hair shorter by using the shorter gauge of the comb so that the fade is achieved, which is lighter and shorter. Step 8 – Trim the hairline in a straight line using clippers without any gauge or a straight razor. Step 9 – Spray a product based on alcohol all over the head to prevent skin irritation or bumps. Here are 20 shadow fade hairstyles that you can choose from. The sides are styled with a burst fade while the curly hair on the top are cut short. The layers of hair on the sides are cut in different lengths for the shadow effect. 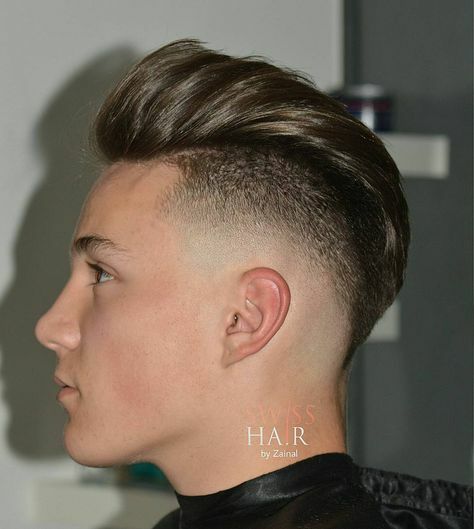 This shadow fade hairstyle resembles the South of France hairstyle, where the sides have a shadow fade and the Mohawk is styled in a tidy way, not like the usual Mohawk styles which are wild and crazy. This is the shadow fade flaunted by many players, especially those in the NBA. The curls on the top are shorter and matched with the shadow fade with the hair from the bottom blended with the top. The hair is step cut and the shadow fade is prominent on the sides. The fade is a low one and the hair on the top is spiked to get a special effect. The part is created by a sharp razor. 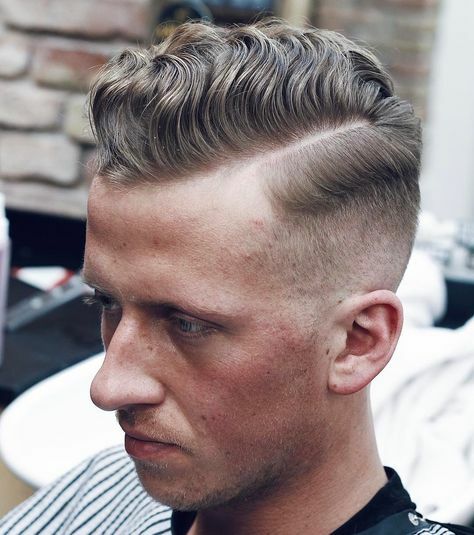 The hair on the top is cropped very short and styled in waves as the sides are next to bald, but the fade lines are hardly to be seen. This haircut will need the skills of a barber. Usher was fond of wearing this shadow fade hairstyle, where the hair on the top is cut short and the sides have a burst shadow fade. The fade is made a little patchy with the clipper being used deeply here and there. Look a the sides blending with the hair on the top, which is cut to medium length. The sides have a high fade and a straight edge up compliments the hair style. 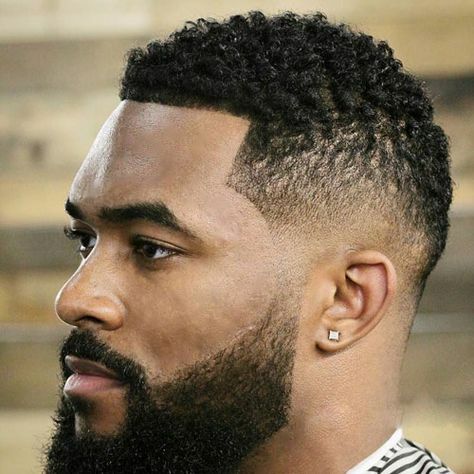 The thick and bushy beard is perfectly matched with the high shadow fade, where the curly hair on the top is cut shorter and the sides and the back clipped to various lengths. The back has a medium fade that goes right to the nape of the neck. The hair on the top is combed towards the front. This haircut is time consuming and will need a skilled barber. 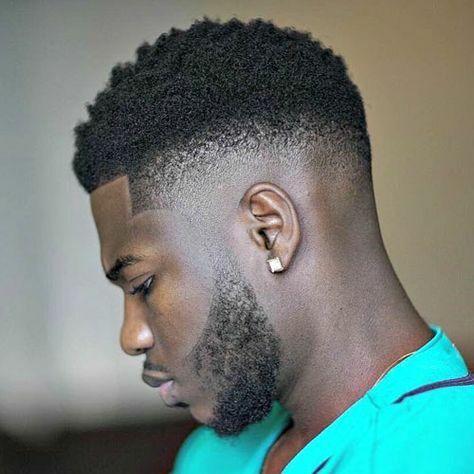 The natural curls have a buzz cut and the sides are shadow faded with a clean edge on the forehead to make this fade hairstyle quite different from others. The shadow fade is medium and at the cortex of the head. The hair on the top is kept long and brushed back. A thin bard compliments the hair style. A high volume pompadour can also be styled with a shadow fade. An extra length of hair is left at the top and the hairs that stick up are combed flat. The fade is at the temples coming down gradually to meet the sideburns. 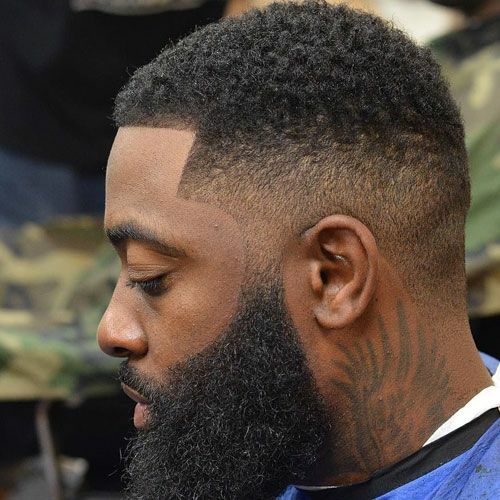 The curly hair on the top is kept to medium length and a thick beard matches the hair style. 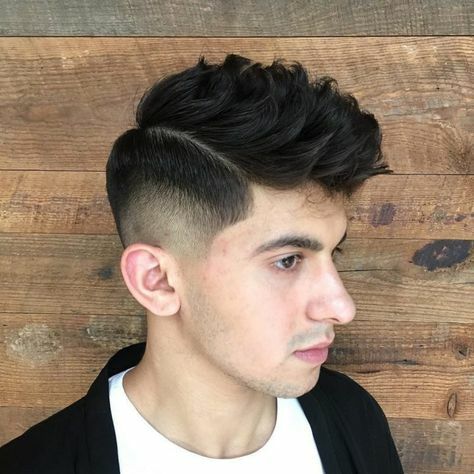 This side part hairstyle is a popular hairstyle and is paired with a low shadow fade, where the region around the ears is tapered, unlike the low or mid fade. 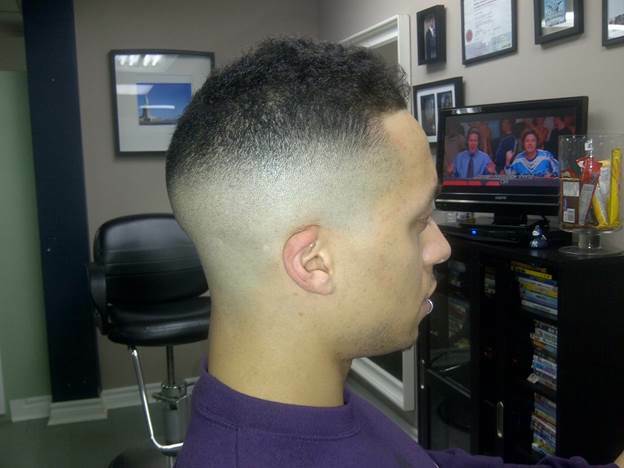 The bald shadow fade is high on the sides and a shape up line makes this haircut look clean and tidy. The use of the clippers with different gauges is noticeable. This is a classic shadow fade haircut, where the hair on the top is styled in a quiff and a medium deep side part is created. The sides have a medium shadow fade. The sides have a skin shadow fade and the curly hair on the top is cut short. The haircut is finished with an edge up right from one temple to the other. The back is styled with a low shadow fade, where the fade lines are distinct and the hair is cut in various lengths that are not too short. The hair on the top is of medium length and brushed back neatly. The natural texture and volume of the hair add more style to this comb-over shadow fade hairstyle. A deep part is also created on one side. The pompadour is styled to look fabulous,more so when it is matched with the low side shadow fade. A part on one side is created to make the haircut look clean and tidy.